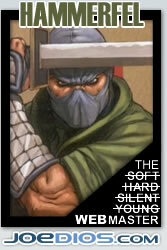 JoeDios.com Forums - G.I.JOE RETALIATION. Did You like it? Last edited by neapolitan joe : 06-28-2015 at 04:27 PM. Loved it. Felt a little rushed on the ending, not happy about the ending result of Duke, but it worked. LOVED CC's new look. Firefly was awesome. Snake's new look was great. President Zartan was funny. Over all.. very pleased. can't wait to see it again and again. "Third G. I. Joe Live Action Movie is a "Go" as G. I. Joe: Retaliation Box Office results soar. "Yo Joe! After a $132 mil opening for G.I. JOE: RETALIATION, Paramount said it will move forward with a third JOE." We are yet to hear the official word from Paramount/Hasbro. " Neutral, didn't love it or hate it, for everything I liked there was something I didn't. end of it all it was just ok. I have not seen it yet, but has anyone seen it in 3D? I was hoping to find out if it's worth checking out in 3D, or just see normal 2D. since it wasn't all filmed in true 3D I'm leaning more towards 2D. "I came, I saw, I blew it up." actually the 3D was amazing... and I would honestly say the 3D was the best I've ever seen... no jokes. Just got back from seeing it with my wife and son. I really enjoyed it and so did my family! Last edited by Hammerfel : 03-31-2013 at 10:01 PM. I really liked the movie, it's WORLDS better than ROC and I see it as a very good start for an even greater third movie. It's a little frenetic tho, 40 minutes more on screening time would have done a good service to the movie. Overall, I'm very happy! I agree, I think that with just 30 minutes more it'd be perfect.